Samsung said Monday it is investigating reports that two Galaxy Note 7 smartphones caught fire in China, where the company previously said all phones for sale were safe and didn't need to be included in a global recall. 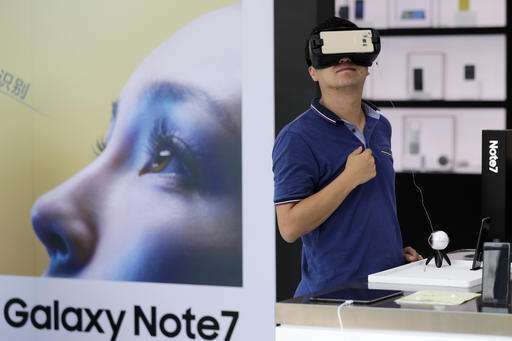 If confirmed, the reports would deepen Samsung Electronics's growing woes with the problem-plagued smartphones. It has already faced criticism that its recall policies have been confusing for consumers and left them uncertain about whether they should continue using their phones. Samsung said it is investigating both reported cases in China, the world's largest smartphone market. A Chinese social media user posted messages on Sunday saying a friend's Galaxy Note 7 caught fire over the weekend, and included photos of the damaged phone. The user, contacted by phone, told The Associated Press the Note 7 was bought Sept. 1 through the JD.com e-commerce site. The man, who asked not to be identified by name, said the phone started to heat up and vibrate late Saturday night, then exploded and emitted black smoke. A second report on a separate social media account said an owner's phone exploded Sunday while the person was playing a game on it. That account gave no contact information for the user or details of where the person lives, but also showed photos of the damaged phone and its serial number. Samsung Electronics launched the Note 7 phone in China on Sept. 1 amid a growing number of reports of the phones catching fire in other nations. The following day, Samsung announced it would stop sales and recall 2.5 million Note 7 phones in 10 countries, but not in China. Koh Dong-jin, Samsung's mobile president, said at the time that sales in China would continue because Note 7 phones sold there used a different battery than those linked to problems elsewhere. Analysts believe Samsung SDI supplied most of the Galaxy Note 7s with faulty batteries, while Note 7 phones in China use batteries made by Amperex Technology Ltd., a Chinese manufacturer that reportedly is also a main supplier of batteries for Apple's iPhone. Last week, Samsung belatedly recalled 1,858 Note 7 phones in China from a different batch that had been distributed before general sales began. The company said the two reports of fires were not from that batch. In announcing its global recall on Sept. 2, Samsung did not initially say whether consumers could continue to use the Note 7 phones without danger. Then a few days later it urged them to immediately turn off the phones. And last week, Samsung said it is rolling out a software update to the Note 7 phones that will limit the battery charge to 60 percent, but it didn't say whether all phones would automatically receive it. This week, the company began shipping new Note 7 phones to replace the defective ones. In South Korea, mobile carriers said Note 7 owners can begin exchanging their phones starting Monday, but there were few people doing so at a Samsung service center. South Korea's government has not issued an official recall like its counterparts in the U.S. and Canada, and for consumers in South Korea to get a full refund for the Note 7, Monday is the deadline. Who did write this article? Yeah, Samsung just successfully copied exploding iPhones, which the article fails to mention. And whatever is meant by "pushing the technology envelope". I'm happy to have a somewhat greater life expectancy than my ancestors. Maybe the author is just being jealous about pushing Samsung and unhappy about Apple not being able to keep up the pace?